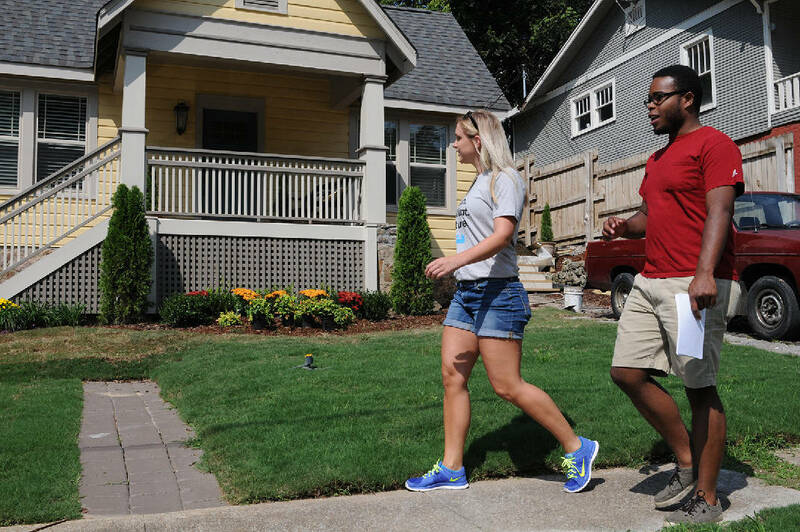 Christina Siciliano, left, and Rudy Foster go door-to-door Thursday in North Chattanooga to invite area residents to a Community Summit on public education in Hamilton County. A group that wants to make it easier for the public to comment at Hamilton County school board meetings is asking for the public's help in reaching that goal. UnifiEd has been calling people at home and urging them to call, email and come to Thursday evening's school board meeting to show their support for the group's proposed change to the public comment portion of such meetings. The Chattanooga nonprofit organization formed about a year ago with the goal of getting people more involved in Hamilton County's schools. UnifiEd wants people to be able to sign up the night of each school board meeting to speak about items on the agenda -- instead of needing approval from school officials 72 hours ahead of time. The group also wants the school board to set aside up to an hour at each meeting's end for people to discuss non-agenda items. UnifiEd's Executive Director Elizabeth Crews issued a news release Monday that said of the 11 major Tennessee school districts whose policies UnifiEd examined, those in seven counties allowed for public comment on agenda items without public notice: Bradley, Knox, Shelby, Rutherford, Johnson City, Kingsport and Sullivan counties. Crews hopes her group's campaign helps convince the local board to change its comment policy. "I would hope that hearing from your constituents ... would let them know this is an issue the community is rallying around," Crews said. There was a promise by school board Chairman George Ricks at the board's Dec. 18 meeting that the public comment issue would be discussed at a yet-to-be-scheduled work session. That meeting followed on the heels of a Dec. 15 meeting, where a Lookout Valley board member said the board already knows how people feel from phone calls and emails. East Ridge board member David Testerman said public comment can get out of hand. Ricks said Monday the board hasn't yet had a chance to schedule the work session, which he said would include other items besides the public comment issue. "We got a lot of things on our plate," Ricks said. "We're trying to meet and discuss that issue. I hope they don't feel slighted." Soddy-Daisy board member Rhonda Thurman has made positive comments at past board meetings about opening up public comment. And she likes some of the other things UnifiEd has campaigned for in the name of transparency, such as having the school district post an easy-to-read version of its budget on its website. "I have asked about that myself," Thurman said regarding the budget. But she, too, said work sessions are hard to schedule, since many school board members have day jobs that keep them busy. "It's not as easy for us to schedule a work session as it might sound," Thurman said. UnifiEd is funded through the Chattanooga-based Benwood, Maclellan and Footprint foundations, the Community Foundation of Greater Chattanooga, and individual donations. Its chairwoman is Alison Lebovitz, whose extended family owns the Chattanooga-based shopping mall business CBL & Associates Properties Inc. Contact staff writer Tim Omarzu at tomarzu@timesfreepress.com, www.facebook.com/tim.omarzu, twitter.com/TimOmarzu or 423-757-6651.